Mal&Chad at Scholastic Book Fairs! Hey everyone! I’m so proud to announce that Mal and Chad will now be carried in Scholastic Book Fairs! I received the scholastic edition a couple days ago, and the books look great! Great news! This should really help Mal & Chad’s visibility! Yay! This is awesome! I know my mom’s third graders would love it! I bought the first graphic novel of mal and chad from scholastic and LOVED IT!!! Then I lent it to 2 of my classmates ande they both said the book was hilarious and cool! Your Mal and Chad books are the best books ever. I like how they timetravel alot. They have the best adventures in the world. 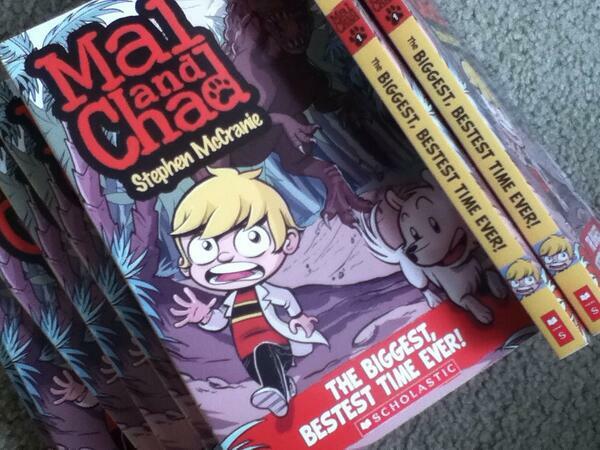 My favrought Mal and Chad book is the biggest, bestest time ever. I miss you making updates ‘n stuff! I just finished reading all three books. Belly Flop was the best! I’m buying more copies for gifts. I can’t wait for more!! Thank you, Stephen! The cover is cute with some fine use of subtle colors…loved it I wish to see mal and chad in form of web comics , Trust me, this will enhance better visibility and branding.